As a grieving widow, Morwenna only wants to make a life for herself and her young son at her murdered husband s estate. Until an unconscious man washes up on her shore, entangling her in a web of mysteries that threatens everything she holds dear. Still grieving the loss of her husband, Morwenna Penvenan fills her days preserving her son s heritage: the dilapidated estate h As a grieving widow, Morwenna only wants to make a life for herself and her young son at her murdered husband s estate. Until an unconscious man washes up on her shore, entangling her in a web of mysteries that threatens everything she holds dear. Still grieving the loss of her husband, Morwenna Penvenan fills her days preserving her son s heritage: the dilapidated estate his father left them. But all attempts at restoration are thwarted when she is accused of deliberately causing ships to crash on her shore in order to steal their cargo. While seeking clues to the true culprits, she finds an unconscious man wearing a medallion with the Penvenan crest enameled upon it. Upon learning of his father s death, David pursues answers to the many questions left in his father s wake: Why was his father in Cornwall when he said he would be in Scotland? Why did he die in possession of a medallion belonging to a prominent Cornwall family? Why did his father take money from the family s ship-building business? And why did someone kill him? Only after waking up at the Penvenan estate under Morwenna s care do the pieces start falling together. To ask other readers questions about A Stranger's Secret, please sign up. Over the last few years, I've come across a few other plots involving washed up, unconscious men discovered by heroines on the shores of their beaches, ponds or swamps. I wondered what would make this one special or different. Being set on the rugged coast of Cornwall was the drawcard for me. It's that nineteenth century time period when wreckers were notorious for deliberately luring ships to their doom for treasure and extra revenue. I was intrigued by the fact that the hero, although a strang Over the last few years, I've come across a few other plots involving washed up, unconscious men discovered by heroines on the shores of their beaches, ponds or swamps. I wondered what would make this one special or different. Being set on the rugged coast of Cornwall was the drawcard for me. It's that nineteenth century time period when wreckers were notorious for deliberately luring ships to their doom for treasure and extra revenue. I was intrigued by the fact that the hero, although a stranger to the heroine, was wearing a medallion bearing her family crest when she found him. Although she helps nurse him back to health, Lady Morwenna Trelawny Penvenan and shipbuilder David Chastain both believe they have good reason to regard each other with suspicion. All he knows is that he'd been on a mission to bring his dead father's body back from Falmouth, and suddenly finds himself a seriously injured guest beneath her roof. And David is well aware that Lady Morwenna is under suspicion of being part of a wreckers' ring herself. She certainly could use the money. For her part, she's desperately trying to clear her name and preserve her infant son's inheritance. Morwenna wonders why that medallion had been in David's possession, and who stole it the moment she was gone. As I read, I wondered whether there might have been a previous novel, as references to Morwenna's grandparents and cousins made the plot sound thicker than it seemed on the surface. Her absent cousins, Elizabeth and Drake, seemed to be written larger than life, making me wonder if their escapades were part of other stories which I missed. I checked and saw that it was true. I should have read 'A Lady's Honor' first, which might have helped make a few aspects of this story clearer. Some sequels can stand alone but I'm not sure this is one of them. Although I liked David from the start, it took me longer to warm to Morwenna. She comes across as very defensive and snippy. Not having read the prequel, I saw no problems with her grandparents' behaviour early on, for example, making me wonder why Morwenna had to keep her stand-offish pride intact. Even as secrets are gradually revealed, I feel her mysterious, self-sufficient attitude helped distance me from this main character who I would have preferred to relate to. She tries so hard to keep everyone at arm's length, it works even with the reader. However, if I'd read that prequel, it might have made all the difference. Being reminded of David's attraction to Morwenna's stunning beauty got a bit tedious, along with how slight and delicately built she is. This was getting to the stage where I was saying, 'Yeah, come on, we know already,' whenever yet another mention popped up. In many ways, the plot is good, with a romance involving a decent dash of mystery and threats of danger. I'd just recommend that you read the first book first, so you're not floundering as I was. Thanks to NetGalley and Zondervan for my review copy. Widowed Lady Morwenna Trelawny Penvanan wants nothing more than to be left in her rundown mansion, but her grandparents want her to move back to their estate … or marry one of her pursuers. Plans change when she finds a shipwreck survivor on her private beach, a strange man with the Trelawny family crest on his pendant. David Chastain is a shipbuilder who has travelled to Cornwell to try and solve the mystery of his father’s death, and the disappearance of their family’s money. But now he’s inju Widowed Lady Morwenna Trelawny Penvanan wants nothing more than to be left in her rundown mansion, but her grandparents want her to move back to their estate … or marry one of her pursuers. Plans change when she finds a shipwreck survivor on her private beach, a strange man with the Trelawny family crest on his pendant. A Stranger's Secret never engaged me. I didn’t understand why Morwenna chose to live in the rundown Penvanan when her grandparents lived in luxury only a short distance away, and where where her parents? These questions were answered, but not until too late for my liking (and I had read the first book in the series, A Lady’s Honor, so that wasn’t the reason). I found the first three-quarters of the novel very slow, which wasn’t helped by Morwenna’s overlong interior monologue (which still didn’t give any information about how she got into her situation, or why she wouldn’t accept help). David wasn’t any better: late in the book, we found out he knew more than he’d let on, which was a problem I had with the first book in the series as well. In contrast, the ending was fast—too fast. I never felt as though I got to know either character. The historical research and sense of time and place was excellent, as were the Christian themes. However, I found some of the writing to be overly complex, almost archaic, even for a novel set during the Regency. There were several times when I found myself reading and rereading sentences in order to understand what was being said. I never had that problem reading Jane Austen. Overall, I found A Stranger’s Secret a struggle to finish, because it took so long to get interesting and I felt no connection with any of the characters. Give me a novel filled with intriguing suspense and I promise you’ll find one very happy reader. In my opinion, there’s nothing like feeling the salt of the sea from the pages of a novel, or getting so connected to the characters of the story -even to the story itself- that they seem within arms reach. I’m glad to say those pleasures were not missed in the second Cliffs Of Cornwall novel, A Stranger’s Secret. I’m so glad this book gave closure to some of the unanswered questions I had about Morwe Give me a novel filled with intriguing suspense and I promise you’ll find one very happy reader. In my opinion, there’s nothing like feeling the salt of the sea from the pages of a novel, or getting so connected to the characters of the story -even to the story itself- that they seem within arms reach. I’m glad to say those pleasures were not missed in the second Cliffs Of Cornwall novel, A Stranger’s Secret. I’m so glad this book gave closure to some of the unanswered questions I had about Morwenna. In A Lady’s Honor, the first novel in the series, the little we get to see of Morwenna made me think that she was nothing more than stubborn and forward. Did I forget to mention exasperating? But as I settled into the novel’s pages, a happy sigh of relief easily escaped when I realized, ”Hey, she isn’t that at all!” And the hero of this story? Definitely worth reading about! At first, I really didn’t know what to expect in this novel. Towards the end, I still didn’t know what to expect. Every time I thought I had everything figured out something in the story would prove me wrong. Every time. Now I’m extremely excited to see what the next book in this series will bring! This review has been hidden because it contains spoilers. To view it, click here. A mysterious stranger. A beauty with a troubled past. I didn’t love this book and I’m not sure why. Something just didn’t click for me. I didn’t really like the main character, but I think it’s just my personal preference. I will be going back to read the first book, maybe reading them out of order is the reason I wasn’t fully engaged. Also the ending was disa A mysterious stranger. Also the ending was disappointing. I was hoping for something more complex. But the villain was a typical spoiled boy who threw a temper tantrum and tried to ruin everyone’s lives. He conveniently falls off a cliff. Everyone forgives everyone else for their selfish pride and lives happily ever after. Regency meets Gothic along the rugged cliffs of Cornwall. Those three things alone sent me into rapid reader rapture. Add in the fact that the author is Laurie Alice Eakes and I was in such a dizzy delirium it's a wonder I could read a word. But I managed -- read every last delicious one while alternately swooning and fuming along the way. This is the second book in the Cliffs of Cornwall series. I think it reads well as a standalone, but you'll 'get' Morwenna (and the complicated Trelawny clan) Regency meets Gothic along the rugged cliffs of Cornwall. Those three things alone sent me into rapid reader rapture. Add in the fact that the author is Laurie Alice Eakes and I was in such a dizzy delirium it's a wonder I could read a word. But I managed -- read every last delicious one while alternately swooning and fuming along the way. This is the second book in the Cliffs of Cornwall series. I think it reads well as a standalone, but you'll 'get' Morwenna (and the complicated Trelawny clan) better if you've read A Lady of Honor. A lady, a man and a mystery. And a very little of a plot. I hate to give a disappointed review of a book I thought I would like. But, unfortunately, the plot there is very predictable and full of cliches. And americanisms (being an European, I wish that historical England (or Cornwall here) was less attractive to the writers who are not from there). I love the authoress' s other works, so I will continue to read her. But I think I will prefer the novels from the American soil, as I can learn more A lady, a man and a mystery. This second book in the series is as enjoyable as the first. Packed with adventure, romance, secrets, and attempted murder, this book is hard to put down. Morwenna is fiesty and passionate, yet yearns to be loved for herself. David is a kind strong character, but doesn't know if he can trust Morwenna or if she is trying to kill him. The ending came a bit out of nowhere, but I really enjoyed the story. Intriguing romance between a jaded lady of position, if not wealth, and a common boat builder who suspects her of involvement in his father's murder. Complicated family relationships and a dab of blue-collar heroism add meat to the bones of a very entertaining read. 3.5 stars. Good book. Nice mystery mixed with clean romance. I felt like I had to plod my way through this book. I didn't really like the writing style or the characters. A miss for me. Captivating! The story grabbed you immediately and held a mystery till the end. The romance was endearing and the characters well crafted. It was great to read further into the family and their history. Well written, with a good plot. There’s enough mystery as well as romance to keep me reading. It is refreshingly clean, as well! Fun, but not well thought out. It was a fun fantasy that was not backed up with dimension. What could've been a great story lacked depth. Book was okay didn’t like it as much as others of Her books. As David recovers in Morwenna s house, they grow to care about one another, while knowing each have reasons to distrust the other. The closer they work together, the more they learn how their lives and mysteries are entwined. As the past continues to intrude on their lives, they must learn to ask the Lord and others for help or risk losing each other and maybe even losing their lives." Lady Morwenna Trelawny Penevan married a heir to a barony, when she was a young woman. When he was foolishly killed a while later, she was left with a son, the heir to the Penevan title. Now all she wishes is to raise her son, quietly and happily with out people standing in her way, trying force their thoughts on both her and her son. What makes it worse is all the security has felt in a tiny cottage in the woods is fall down around her, bit by bit. To make things worse, ships are continuously crashing on rocks, on the beach before her home. And again she is blamed for the crash. Once more she ventures to the shore line to see if anyone survived the dreadful accident. And there she finds a man cold, wet and unconscious, but yet he still breathes. David Chastain learned of his father’s death and headed to the spot to fetch his body. When he arrives he finds a letter and a medallion around his neck. The medallion having the Trelawny Crest, is unlike anything he has seen before. Soon he is on a ship headed back home, but that too comes to an abrupt end. He awakens in severe pain, with a dark haired angel, tending to his wounds. It all seems fine until he discovers the medallion that once was around his neck has come up missing. Accusing the pretty woman of this misfortune only makes her upset and she begins questioning him herself about how he came to receive her families medallion. Morwenna and David both find that their questions both come up unanswered. As she nurses him back to health, all while reputation continues to go down hill. But when someone wishes for David’s life, Morwenna and David must team up to find out who is after him and why. All while, they try keep their growing feelings to themselves. I just adore Laurie Alice Eakes’ books, she has this amazing way to incorporate a mystery into a beautiful love story. Once I start reading I just can’t put it down! This book is book 2 in the Cliffs of Cornwall series. And I’m looking forward to the authors new book that is coming out in December! A Stranger’s Secret is the sixth book I have read by this author. In some ways, I might say it was better than the previous title in series, with its somewhat worn characterization of the superfluous and wonderful American hero. Morwenna was an interesting character in the last book, and is the protagonist in this one, which made things somewhat more interesting to see her come into her own, and her perspective on events. I am sure though that her son’s name was changed- I’m sure I remember her A Stranger’s Secret is the sixth book I have read by this author. In some ways, I might say it was better than the previous title in series, with its somewhat worn characterization of the superfluous and wonderful American hero. Morwenna was an interesting character in the last book, and is the protagonist in this one, which made things somewhat more interesting to see her come into her own, and her perspective on events. I am sure though that her son’s name was changed- I’m sure I remember her calling him Conan after his father in the last one- but now he’s called Mihal- some kind of Cornish version of Michael, apparently. As for the hero- well like most in romance novels is was hugely handsome- though not as annoyingly sanctimonious as Rowan Curnow from the last book, and was at least credible. Except perhaps his Somerset accent. There were also some wonderfully evocative and realistic depictions of the Cornish landscape, with some exiting scenes- but- I could say the first part of the novel was better. By the end I felt that the mystery was drawn out for too long, and events as well as the characters actions and responses became too predictable and repetitive. I mean David was poisoned something like three times- and the device of every chapter, or almost every chapter, having to end with some dramatic event or cliff-hanger just didn’t always work for me. Could this reader be forgiven for mentioning Drama at the expense of other aspects of good storytelling? Sadly also, this novel seemed to have a lot of the clichés of romantic fiction, with characters kissing and touching at really inappropriate or illogical moments- including in company- beating themselves up about how it was totally unseemly- then doing it again. I also found some of the characters attitudes annoyingly inconsistent. Morwenna’s grandparents for instance seemed to be presented as loving and having her best interests at heart one minute- then shortly after she would be griping about how ‘authoritarian’ they were. I have noticed that a few other books by this author seem to level the same accusation at authority figures such as parents- and it times it seems to be for no other reason than that they won’t let the protagonist do what they want- even if it’s dangerous, stupid or illogical, because it goes against their ideas of personal ‘freedom’. On a personal level, I did not appreciate the passage in which one of the characters was scornful of the idea of freedom and equality- saying another character who believed it was as bad as an American- which seemed to be implying that such ideas were alien and abhorrent to ‘proper’ high-born Brits. To me, this seems a very arrogant notion, suggesting that Americans invented freedom and had some kind of monopoly on it. American readers might attack me for this- but neither of the above is true. Gripes aside, I would say this book was a marginal improvement on the last one, which annoyed me for several reasons which were mostly not present here. It is honestly not a bad novel, I just don’t think it’s that brilliant or has much to make it stand out from the crowd. Certainly worth reading as a decent regency with an interesting backdrop and a solid Christian theme. This series and author are not personal favourites, but others make like them better. I received a free Kindle Edition of this book from Zondervan via Booklookbloggers for review. I was not required to write a positive one and all opinions expressed are my own. I would have enjoyed it more if I had read the first book in the series before picking up this one. David Chastain arrives in Cornwall in a most unconventional fashion…as the sole survivor of a ship wreck. He is nursed back to health by Morwenna Penvenan. David had set out from his home where he works as a boat builder to find out more information about his father’s sudden death a month ago after his father left secretly with all the money the family had been saving. His father died in a place where he was not supposed to be and if David can’t find the answers he seeks, the family boat building business could very well go under. Did his beautiful rescuer have anything to do with his father’s death? Morwenna Penvenan is a young widow with a small child, trying to hold on to his inheritance, but is losing the battle. She has little money, no means to earn any and a surfeit of pride that refuses to allow her to ask her grandparents for help. She is the target of a local group of ship wreckers and most believe she is part of the group due to her rebellious actions of the past. However, since her marriage more than two years ago, Morwenna has tried her best to live as a Christian. She discovers David’s battered body on the beach and takes care of him. While he heals, she wonders what he remembers of the ship wreck and if he can tell her anything that might lead to their capture. She is desperately trying to get investors to invest their money in the flooded tin and copper mines on her land so she can make some money to provide for her son and his future. Does David really remember nothing about the ship wreck as he claims? This story has a good mystery, but doesn’t move too fast. There isn’t a lot of action until the couple of chapters with most of the story focused on the developing relationship between David and Morwenna. I liked the setting and Morwenna’s dedication to her son. David also was a good example of a man trying to live by the Christian principles taught to him by his parents. I could certainly relate to Morwenna’s pride and stubborn streak! I also liked reading about her struggles to live a new life as a Christian amidst a whole village that knew about her past; it made her character so much more realistic. Laurie Alice Eakes in her new book, “A Stranger’s Secret” Book Two in the Cliffs Of Cornwall series published by Zondervan brings us into the life of Lady Morwenna Trelawny Penvenan. From the back cover: As a grieving young widow, Morwenna only wants a quiet life for herself and her son. Until a man washes ashore, entangling her in a web of mystery that could threaten all she holds dear. Lady Morwenna Trelawny Penvenan indulged in her fair share of dalliances in her youth, but now that she’s the w Laurie Alice Eakes in her new book, “A Stranger’s Secret” Book Two in the Cliffs Of Cornwall series published by Zondervan brings us into the life of Lady Morwenna Trelawny Penvenan. Ships are deliberately being lured off course to crash so their cargo’s can be stolen. And Lady Morwenna is being blamed for these shipwrecks as if she is a siren from Greek mythology. David was injured in one of these shipwrecks and now Morwenna is nursing him back to health. He suspects her about a possible connection to his father’s murder. Now, somehow, these two must learn how to work together to find out who really is behind these shipwrecks, clear her reputation, solve his father’s murder and blossom in their romance. Murder, mystery and intrigue fill these pages. David and Lady Morwenna are such wonderful characters that you do not want the book to end so that you can continue to hang out with them longer. “A Stranger’s Secret” is full of reputation, finding your place in the world and romance. This is an interesting story filled with lots of excitement and romance as well as history. I liked it a lot. Lady Morwenna Trelawny Penvenan indulged in her fair share of dalliances in her youth, but now that she's the widowed mother to the heir of the Penvenan title, she's desperate to polish her reputation. When she's accused of deliberately luring ships to crash on the rocks to steal the cargo, Morwenna begins an investigation to uncover the real culprits and stumbles across an unconscious man lying in the sea's foam—a man wearing a medallion with the Trelawny crest around his neck. The medallion is Lady Morwenna Trelawny Penvenan indulged in her fair share of dalliances in her youth, but now that she's the widowed mother to the heir of the Penvenan title, she's desperate to polish her reputation. When she's accused of deliberately luring ships to crash on the rocks to steal the cargo, Morwenna begins an investigation to uncover the real culprits and stumbles across an unconscious man lying in the sea's foam—a man wearing a medallion with the Trelawny crest around his neck. The medallion is a mystery to David Chastain, a boat builder from Somerset. All David knows is that his father was found dead in Cornwall with the medallion in his possession after lying and stealing his family's money. And he knows the widow who rescued him is impossibly beautiful—and likely the siren who caused the shipwreck in the first place—as well as the hand behind whoever is trying to murder David. As Morwenna nurses David back to health and tries to learn how he landed on her beach, suspicion and pride keep their growing attraction at bay. But can they join together to save Morwenna's name and estate and David’s life? Can they acknowledge the love they are both trying to deny? The story line was good and I did enjoy the book. A few things I found to be a little repetitive. We were always being told how poor Morwenna was and all she had to do was marry someone of her grandparents choosing and her dowry would be released. Of course they had a couple of men picked out for her. Forget that she didn’t love either one of them. I realize in that day and age women didn’t have much say in who they married. David was always being referred to as being of an inferior class to Morwenna. There was some mystery to the book but not as much as I had anticipated from reading the description by the publisher. This was the second book in the Cliff’s of Cornwall series. I did not read the first book in the series and I feel it might have made this book a little easier to understand. There were references to people that made me think their stories were told in the previous book. I enjoyed reading about the history of the area. I really wanted to give this book five stars but I couldn’t. I found the book to be slow in several places. Therefore, I can only give this book three stars. I was given this book by the publisher for an honest review. I was not compensated in any way. When I requested this book, I didn’t realize that it was the second in a series. I knew that it was labeled a ”Cliffs of Cornwall” novel, but it didn’t say anything about it actually being a series. That being said, I was a bit lost through some parts of this book. I was able to pick up on most of the background for Morwenna eventually, but the other characters continued to be confusing even as I kept going in the story. The names of the secondary characters were not always recognizable, which m When I requested this book, I didn’t realize that it was the second in a series. I knew that it was labeled a ”Cliffs of Cornwall” novel, but it didn’t say anything about it actually being a series. That being said, I was a bit lost through some parts of this book. I was able to pick up on most of the background for Morwenna eventually, but the other characters continued to be confusing even as I kept going in the story. The names of the secondary characters were not always recognizable, which made it harder to keep them straight – especially when they were sometimes referred to by their first names and sometimes by their last names. I felt as if I needed a character list at the beginning! And while the main characters were well-drawn, the other ones seemed to just be thrown in here and there when needed. There was a real disconnect between the main characters and the secondary ones, and I don’t really know how that could have been rectified. Even though the characters were sometimes confusing, the overall storyline was good. I liked how Morwenna and David met and the circumstances and emotions that played out during their relationship. As I said earlier, the main characters were much more fleshed out than the others which made me care more about them than I was expecting at the beginning of the book. The secrets and mysteries in this novel were really what kept it going. At times it became a bit slow when Morwenna and David would start on their inner monologues. But then another part of the mystery would unravel (or poor David would be drugged again – seriously, how many times did that happen?) and the story would again pick up. As for the spiritual aspect, it was there – David and Morwenna both professed faith in God – but it probably could have been developed a little bit more. I wasn’t completely unsatisfied with how their faith was portrayed. I just thought it needed some more depth to it. I did enjoy Morwenna’s obvious devotion to her young son. Her affection for him was touching, as was her determination to do the best she could for him and for his future. One of the most suspenseful books I've read. It keeps you wondering from beginning to end. A Christian Historical Romance set in 1813. I think it would have been helpful to have read the first book. You can read it as a stand alone, but I think it would have been a richer experience to have had the full background from the first book. Lady Morwenna Trelawny Penvenan is a widow wanting to hang onto her husband's impoverished estate for her son's inheritance. She won't accept help from her overbea One of the most suspenseful books I've read. It keeps you wondering from beginning to end. A Christian Historical Romance set in 1813. I think it would have been helpful to have read the first book. You can read it as a stand alone, but I think it would have been a richer experience to have had the full background from the first book. Lady Morwenna Trelawny Penvenan is a widow wanting to hang onto her husband's impoverished estate for her son's inheritance. She won't accept help from her overbearing, wealthy Grandparents and tries to handle everything on her own. But her scandalous past and that of her husband holds her back. David washes up on Morwenna's beach after wreckers lure the ship to unsafe waters along her shore. The wreckers are setting her up to make it look like she is doing it. But there was a reason he was on that ship. He was looking for answers about his father's death and the significance of the Trelawny medallion that his father had. The medallion that David had until Morwenna left him to get help. They both are seeking answers from each other, and both keeping secrets. There's lots of "romantic tension" throughout. There were some parts that seemed more like "formula" writing to me. Like the scene where Morwenna goes for a horse ride with others, only to turn back and fall off her horse. Unless I missed something, it seemed the only point was that her clothes were too tight, popped open and became too revealing when she fell. Other than that, it was a very good read and grabs your attention from the first paragraph. There are good Christian lessons here and there throughout the book about pride, honoring parents and trust in others and in God. The characters become endearing. I would like to know what becomes of everyone as time goes on! 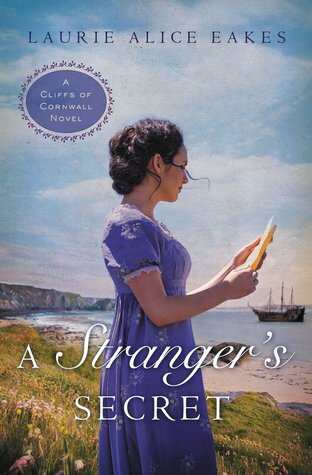 "A Stranger's Secret" by Laurie Alice Eakes is set in 1813 Cornwall, England. Morwenna Trelawny Penvenan is deperate to bring prosperity to Penmara, her son's inheritance and the only thing she has left of his father. She could get help from her grandparents, but her pride won't allow her to do so. When wreckers are purposefully causing ships to run aground on her land, she sets out to prove she isn't the one behind them. What she finds is not clues but more questions when she discovers David Ch "A Stranger's Secret" by Laurie Alice Eakes is set in 1813 Cornwall, England. Morwenna Trelawny Penvenan is deperate to bring prosperity to Penmara, her son's inheritance and the only thing she has left of his father. She could get help from her grandparents, but her pride won't allow her to do so. When wreckers are purposefully causing ships to run aground on her land, she sets out to prove she isn't the one behind them. What she finds is not clues but more questions when she discovers David Chastain nearly dead on her beach wearing a Trelawny medallion around his neck. David Chastain is trying to solve the mystery of why his father emptied their family and boatyard's coffers and went to Falmouth suddenly and ending up dead. After attempts on his own life, the most likely suspect is Morwenna Penvenan. Despite the fact that Morwenna knows that David is keeping secrets from her and David suspects Morwenna of trying to poison him, they find themselves growing more attached to each other. Can they find the true suspect behind the wreckers and poisoning before it drives them apart? There are a few authors that when I see that they have a new book available, I know I have to read them. That is how I felt when I saw "A Stranger's Secret" by Laurie Alice Eakes. I read the first book in the Cliffs of Cornwall series, "A Lady's Honor", so I knew I wanted to read the sequel. Since "A Stranger's Secret" is the 2nd in the series, I would recommend reading "A Lady's Honor" first so you can get Morwenna's background and where she is coming from in "A Stranger's Secret". Laurie Alice Eakes has a good pace and flow to the story and I wasn't able to solve the mystery before the book revealed it. I liked David and how she told about his accent without having to write it out in the book. There weren't any parts of the book that took me out of the setting of 1800's Cornwall. Lady Morwenna Penvenan is struggling to rebuild her murdered husband's Cornish estate for her infant son. The mines that could provide the necessary capital are flooded, and she's unable to find investors. Because of her poverty and her desire to rebuild the estate, people believe that she is involved with the wreckers who lure ships to the coast where they founder on the rocks. Then the wreckers strip the ship of its cargo. Morwenna hates being suspected of this crime. She feels that people think the worst of her because of her wild past. After one of the wrecks, she is walking the beach looking for clues when she finds an unconscious man. Around his neck is a medal with the Trelawny crest, her grandparents' crest. Hoping that if he lives he can give her some insight into the wreck, she takes him to her house to try to bring him back to health. David Chastain is a boat builder. He was on his way to Fallmouth to try to find out what happened to his dead father. His father, also a boat builder, took all the money from their account and went to Fallmouth. David wants to know the reason. After his death, David was given the medal he was carrying. When he regains consciousness, he realizes that he has landed close to the origin of the mysterious medal, and he wonders how much Morwenna knows about the wreck and his father's death. The Cornish coast in the nineteenth century is a wild background for a romantic tale. The author uses the attributes of the coast, the rain, winds, and tides, to weave a spell around the romance of David and Morwenna. The plot focuses on their distrust of each other and their growing attraction. I enjoyed the story, David's father's death adds an element of mystery that enhances the romantic tale. David is a character you can't help but love. He's a member of the lower classes thrown into a nobleman's house, and he holds his own very well. I enjoyed Morwenna, but her thoughts about doubting herself because of her past became rather tedious. If you enjoy romance with a hint of mystery, you may enjoy this book. I reviewed this book for BookLook Blogger. Once promiscuous Morwenna Penvenan, now widowed, only wants to spend her life being mother to her son, Mihal and to restore her late husband’s run-down estate for her son. However Morwenna finds life is never easy; especially with her reputation…someone is deliberately directing ships into her beach during storms as a safe haven only to be wrecked so they can steal the cargo. Although she understands people in her community are starving because the copper mines have closed, she cannot understand Once promiscuous Morwenna Penvenan, now widowed, only wants to spend her life being mother to her son, Mihal and to restore her late husband’s run-down estate for her son. However Morwenna finds life is never easy; especially with her reputation…someone is deliberately directing ships into her beach during storms as a safe haven only to be wrecked so they can steal the cargo. Although she understands people in her community are starving because the copper mines have closed, she cannot understand the destruction of others. After each storm she combs the beach for clues as to who is using her property to cause such devastation when she stumbles upon a barely-breathing man, David Chastain, wearing the medallion with the Penvenan Crest. Barely alive she takes him to her home and nurses him back to health. She learns he is on his way to Cornwall to find out how his father died. They have a mutual distrust for each other…all because the medallion is missing and Morwenna is accused of luring the ships to their destruction. Somehow their lives are intertwined…but how? From the first page, I was hooked! What is not to love about a wronged heiress, murder, attempted murder and love? The plot and characters are well developed, leaving you feeling as if you are part of the story. My heart went out to Morwenna as she struggled to control her temper and develops her newly found faith in God, especially when it seems everyone around her is against her. This book will have you turning the pages, unable to put it down until the last page is read. Disclosure: I was given a copy of this eBook by the publisher, Zondervan, through NetGalley blogger program for review. I was not required to write a favorable review nor was I compensated for my review. The opinions in this review are my own. Laurie Alice Eakes used to lie in bed as a child telling herself stories so she didn’t wake anyone else up. Sometimes she shared her stories withothers; thus, when she decided to be a writer, she surprised no one. Family Guardian, her first book, won the National Readers Choice Award for Best Regency in 2007. In the past three years, she has sold six books to Baker/Revell, five of which are set du Laurie Alice Eakes used to lie in bed as a child telling herself stories so she didn’t wake anyone else up. Sometimes she shared her stories withothers; thus, when she decided to be a writer, she surprised no one. Family Guardian, her first book, won the National Readers Choice Award for Best Regency in 2007. In the past three years, she has sold six books to Baker/Revell, five of which are set during the Regency time period, four books to Barbour Publishing, as well as two novellas to Barbour Publishing and one to Baker/Revell. Seven of her books have been picked up by Thorndike Press for large print publication, and Lady in the Mist, her first book with Revell, was chosen for hardcover publication with Crossings Bookclub. She also teaches on-line writing courses and enjoys a speaking ministry that has taken her from the Gulf Coast to the East Coast. Laurie Alice lives in Texas with her husband, two dogs and two cats, and is learning how to make tamales.